California Speed is the perfect balance of outrageous tracks, great car handling, and pure adrenaline-pumping acceleration. California speed has tons of tracks to satisfy all types of players, ranked according to three difficulty levels. There are three closed-circuit tracks modeled closely after famous race tracks, and an amazing eleven open road courses that wind through locations as varied as cities, deserts, mountains, beaches, shopping malls, golf courses, roller coasters, and even a UFO. Atari Games went all out to make Speed the wildest driver ever! You can laugh at the local speedl imits in your choice of vehicle. There are twelve cool cars to select from – including road racers, concept cars, high performance, and classics. Speed uses a hardware built around the 3Dfx chipset, which has powered other great games like San Francisco Rush and NFL Blitz. As a result, Speed has some of the cleanest, sharpest graphics ever seen in a video game. Atari Games has gone the extra mile to ensure great earnings long after installation, including loads of shortcuts to encourage exploration off the main track. Players will be eager to try Speed's "Do the State" feature – once all fourteen courses are completed players are rewarded with one of several different game endings. As if that weren't enough, players can play any of the tracks in reverse in the special mirrored track mode. Last but not least, Speed offers easy car handling, ensuring that every player who sits down will have an fun-filled enjoyable experience. There are no messy crashes or realistic physics to get in the way of the fun – players get right back into the action quickly. California Speed is available in the operator-friendly Midway single seat cabinet. Time-tested for durability and convenience, the cabinet is easy to transport and rotate. Two versions are available – the classic 25″ and the deluxe 33″ configuration. Both are linkable for up to four-player play. Linking adds extra income to collections. Units are linkable out of the box. A hub is neede to link three or more units. For the operators who want to make a big impression, there's the deluxe overhead attraction with neon lighting. 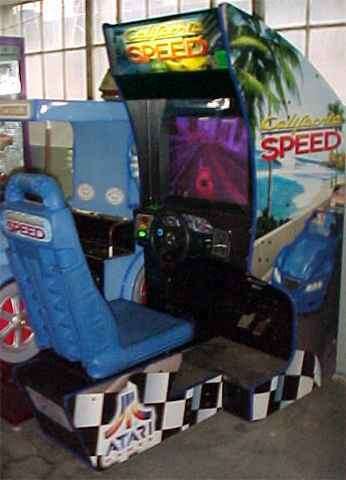 California Speed is the number one driving game in all test arcades, and will be the "must have" game of the year. Don't miss out on Speed – they'll be going fast.